I finally started the preparation of the individual component. It was a moment I have been looking forward to with great anticipation. 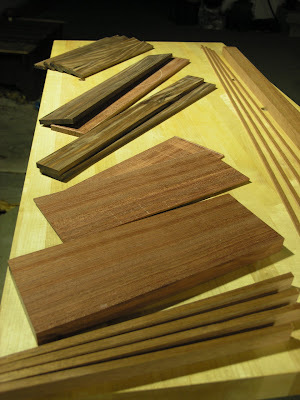 Mostly because I could use my bandsaw for the purpose it was bought for - resawing guitarwoods! For this resawing I had bought two blades: Iturra's 'Bladerunner' (identical to Highland Hardware's 'Woodslicer, only half the price) and the Lenox Carbide Tipped Tri-master, both 1/2" blades. I had hoped to use the Bladerunner with it's roughly 1/32" narrow kerf for the bubinga in order to get five 1/8" slices out of the 3/4" board. Two for the back, two for the sides and an orphan, or a spare, in case something would go wrong later in the build - I'm going to bend the sides by hand later! The five slices would also give me four strips of binding as well as an centerstrip for the back. I put the Bladerunner on the saw, tensioned the to 15.000, tracked it and set my guides and tried some test cuts in some 9' wide maple but I couldn't get the blade to behave. It squealed and howled it's way though the stock only to reveal a cut that had wandered all over the place. I tried to lube the blade, same result. I thought maybe I should adjust the fence for drift but it seemed the blade just went randomly from left to right. After a while I decided to give it up and try the Lenox blade instead. The Lenox blade has a considerable wider kerf, about a 1/16", so I had to give up the idea of getting five slices. But before I changed blades I cut the binding portion off and sliced it up into five as I first had intended with the whole board. The Lenox blade was quite a different animal! I also tensioned this one to 15.000 psi, though I think the saw really got stretched to it's limits. I have an Iturra spring in it and it held the tension with no problem, but I had to use considerable force to turn the tensioning crank. It did not like the last couple of turns. I think I'll try to go a bit easier in the future and see what happens. The Tri-master went though the stock with straight cuts, great commitment and endurance. Still noisy, though. The only time the cuts became uneven was when I didn't hold the wood steady against the fence or table. 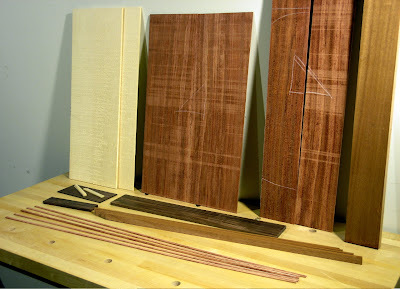 I ended up with four sliced just under 1/8" and a bit of some veneer from the last cut. It cut though the Bolivian rosewood with even greater ease. 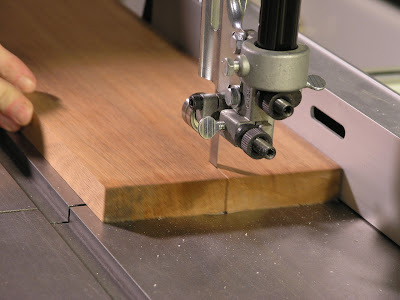 It seems that the denser the wood the easier it was for the Tri-master to cut. I did some test cut in walnut and the blade appeared to be struggling with that the most. I read somewhere that shavings from softer wood tend to swell more and fill up the gullets creating more friction and heat. I don't know if it's true, but it certainly appears to be the case here. In retrospect I think I was a bit naive to think I could get five slices out of a 3/4" board. At least with my setup and skill level, whatever blade I used. It is nice to make the most out of what you have but being this frugal, could easily have yielded me nothing. What I did get was stock that, when all the saw marks have been planed away, will be barely about 0.100" and no definitely more. A close shave. One side of the bubinga showed more interesting figure with darker ink lines and medullary rays and I had planed to use that for the back. Unfortunately I ended up cutting what was intended for sides into back and visa versa. It is not disastrous but a shame nevertheless. To add salt to the wound, I also forgot to cut off a bit of the end of the mahogany to use for an end block and back joint reinforcement, before I ripped it into the neck blank. One must learn to pay attention! The little white pieces are bone for the nut and the saddle. It stank when I cut it up! At the end of the day I had a lot of usable left overs, well, left over. 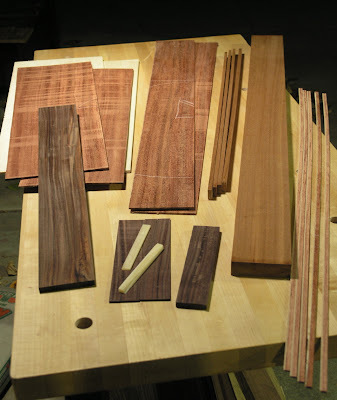 Enough for several fingerboards, saddles, kerfing, bracing, a set of bindings and a couple of face plates and lots of nuts and saddles for future builds.